It’s easy for me to choose to support the Ada Initiative, because when I think about the kind of web I want to be part of, I know that they are doing some of the most visible work in in making it so. I also know I wouldn’t be where I am today without the work of both Val and Mary, the Ada Initiative founders. Back in 2005, in the middle of my university studies, I discovered Wikipedia. Back then it was something you needed to discover, not something that was just there all the time. I enjoyed wiki editing and got involved in many different aspects of the project. In 2007 I attended my first community tech conference, Wikimania in Taiwan. It was probably the first time I had the “these are my people” feeling. It strongly cemented my enthusiasm for the community and was the start of many very strong friendships. I attended the next three Wikimanias (Egypt, Argentina, Poland) and I have such fond, warm memories of spending time with those people that I got to meet precisely once a year. Wikimania 2007 was also the time of the first WikiChix lunch (that’s me in red). WikiChix, a women-only mailing list, had been founded in late 2006, to a huge amount of hostility, which was a shock to me. I learned that it was modeled on LinuxChix, which had a grrls-only list started by Val. Enthusiasm for the “free culture” philosophy behind Wikipedia’s copyleft licensing led me to take an interest in the free software movement – although using Linux on my laptop was still a little scary. Somehow, I don’t remember now, I heard about an upcoming conference that was going to be held at my uni – linux.conf.au, in early January. I decided to submit a talk about Wikipedia to the LinuxChix miniconf. Which is how I met Mary, who was one of the organisers. 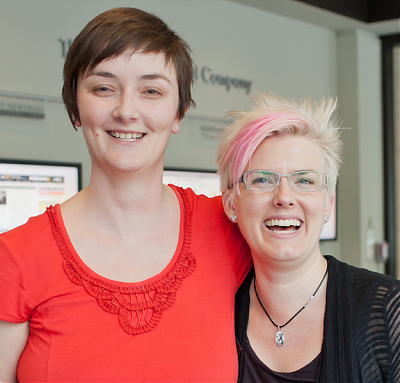 She has also been one of the lead LinuxChix organisers in Australia (now OWOOT). Later in 2008 the geek feminism wiki was founded by Skud, and in 2009 the counterpart blog began. 2009 was a bit of a breakthrough year, I think. Not in terms of outcomes, but in a groundswell of women documenting their experiences and making contact with each other so that each complaint became part of a history, rather than being dismissed without context. The geek feminism wiki and blog were (and continue to be) very important and thoughtful resources to me. Through this I have done a lot of thinking about why I took pride in being an honorary guy and why I felt somewhat uneasy about putting my hand up for community building work on the regular. Back on track: Having this community (the geek feminism community) has helped me not feel isolated, and given me amazing resources to avoid having conversations from first principles every single time. In 2012 I got to attend the first AdaCamp in Melbourne and again enjoy a “these are my people” moment. This community, more than anything else, is what will help me avoid burnout and have a career in “open stuff” that is longlived and enjoyed. That’s my plan, anyway. So, I can draw lines directly from Val and Mary’s work to my own position today – I am deeply grateful for all the fights they have had so that I didn’t have to. For their work to set up structures and events to bond communities online and off. As you might guess from my Wikimania and LCA attendance record, I think conferences can be a hugely important and rewarding part of participating in open source/free culture communities. I would encourage anyone to do it – and know that if you attend a community tech event with an explicit anti-harassment policy, it’s directly or indirectly because of Mary and Val’s work. This is why it’s a no-brainer for me to make a monthly donation. The Ada Initiative fundraiser is ending soon and I encourage you to donate now, either once or ongoing. Use your dollars to vote for an open web that is more welcoming to women. Mary and Val, Ada Initiative founders. By Adam Novak, licensed CC-BY-SA.